12 v. : ; 25-35 cm. v. 1-12, no. 18; July 5, 1956-Mar. 30, 1967. Includes supplements consisting of bills, ordinances, statutory rules & orders, etc. Reference to the Heads of te Index. Appointments, Promotions, Leave of absence to Public Officers, Executive and Legislative Councils, Boards. Committees, Foreign Consuls, Departmental Reports, etc., etc. by EiL PIGoTT, Govcrnrnet Printer.-By Authority. Athill, R. 215 Daley, R. V. 104 H.
Fisher, G. J. 239 J. La Barrie, Mrs. N. 142, 195, 269 Pigott, Miss K. 217 T.
Roberts, Miss C. 114, 205 U.
Marnham, J. E., C. M. 0,, M. 0.. T. I). Robinson, J. L. 281 V.
Marshall, R. 55 Rodgers, C. A. 104 Vanderpoole, Police Sergeant, J. J.
Mason, J. R. 104 Ryan, Miss B. E. 218 W.
iv INDEX TO THE ANTIGUA, MONTSERRAT & VIRGIN ISLANDS [VoL. III, 1958. 15 ,, ., Supplementary Appropriation (1955) 285 SUBSIDIARY LEGISLATION. 16 ,, External Trade 281 Antigua. Experiments) 165 of The West Indies) (Amend. 24th February, 1958, a Public ,, 40 Pensionable Offices (Amend. ,, 11 .. .. Adaptation of Laws (Election Virgin Islands. ,. 7 ,, is Bell Vue Protected Area Order 206 IMPERIAL LEGISLATION. ADVERTISEMENTS, Financial Returns, Notices, Trade Marks, etc., etc. City Rates 82, 90, 97, 121, 124, 216, 220, 229 Federal Information Service 225, 226. Court of Appeal Sittings 115, 121 Princess Margaret 123. 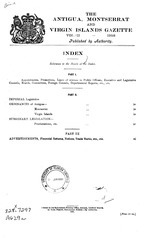 Medical Register 56, 77, 110, 289 198, 202, 206, 208, 254, 257.
viii INDEX TO THE ANTIGUA, MON'ISERIUAT & VI GIN ISLANDS [VOL. III, 1958. 168, 175, 176, 196, Swift and Companiy 132. 133, 137, 138, 139, 140.